In the Custom Type Example, we showed how to integrate custom types with the meta-object system, enabling them to be stored in QVariant objects, written out in debugging information and used in signal-slot communication. In this example, we create a new value class, Block, and register it with the meta-object system to enable us to send instances of it between threads using queued signals and slots. The Block class is similar to the Message class described in the Custom Type Example. It provides the default constructor, copy constructor and destructor in the public section of the class that the meta-object system requires. It describes a colored rectangle. We will still need to register it with the meta-object system at run-time by calling the qRegisterMetaType() template function before we make any signal-slot connections that use this type. Even though we do not intend to use the type with QVariant in this example, it is good practice to also declare the new type with Q_DECLARE_METATYPE(). The implementation of the Block class is trivial, so we avoid quoting it here. We define a simple Window class with a public slot that accepts a Block object. The rest of the class is concerned with managing the user interface and handling images. The Window class also contains a worker thread, provided by a RenderThread object. This will emit signals to send Block objects to the window's addBlock(Block) slot. The parts of the Window class that are most relevant are the constructor and the addBlock(Block) slot. The constructor creates a thread for rendering images, sets up a user interface containing a label and two push buttons that are connected to slots in the same class. In the last of these connections, we connect a signal in the RenderThread object to the addBlock(Block) slot in the window. The rest of the constructor simply sets up the layout of the window. We simply paint these onto the label as they arrive. The RenderThread class processes an image, creating Block objects and using the sendBlock(Block) signal to send them to other components in the example. The constructor and destructor are not quoted here. These take care of setting up the thread's internal state and cleaning up when it is destroyed. Each signal that is emitted will be queued and delivered later to the window's addBlock(Block) slot. This call is placed here to ensure that the type is registered before any signal-slot connections are made that use it. The rest of the main() function is concerned with setting a seed for the pseudo-random number generator, creating and showing the window, and setting a default image. 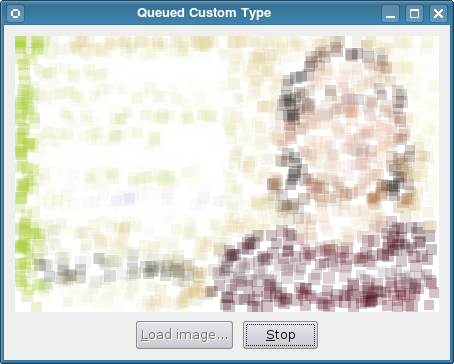 See the source code for the implementation of the createImage() function. This example showed how a custom type can be registered with the meta-object system so that it can be used with signal-slot connections between threads. For ordinary communication involving direct signals and slots, it is enough to simply declare the type in the way described in the Custom Type Example. In practice, both the Q_DECLARE_METATYPE() macro and the qRegisterMetaType() template function can be used to register custom types, but qRegisterMetaType() is only required if you need to perform signal-slot communication or need to create and destroy objects of the custom type at run-time. More information on using custom types with Qt can be found in the Creating Custom Qt Types document.